As its name suggests, evergreen trees keep their green leaves all year long. Or, at least it looks like it from the outside. Take a stroll through a blue spruce grove and you will observe thousands of needles lining the grounds. Evergreens do drop their leaves. They just do it gradually over time instead of all at once, like deciduous trees. Though many evergreens are conifers, you can find evergreen maples, cypresses, and honeysuckle trees. The ability of evergreens to maintain their foliage throughout the year is frequently seen as an adaptation in warmer environments. Why, then, are evergreens, such as the spruce or pine tree, typically associated with colder environments? Cold weather can have damaging effects on the leaves of a tree. That is why deciduous trees drop their leaves in cold weather. Deciduous trees more or less hibernate during the cold season, choosing to wait for warm weather before beginning new growth. Evergreen trees in these cool climates must have a different reason for their leaf dropping schedule. And they do. Whenever deciduous trees drop their leaves, they are losing valuable nutrients, growth time, and sunlight. Evergreens are now thought to keep their leaves primarily as an adaptation to low nutrient levels. Being able to increase its nutrient levels enables evergreen trees to grow in a wider variety of locations with poorer soil and nutrient matter than their deciduous competitors. Many evergreen species have what look like little green needles. Some might ask where are the tree’s leaves? The needles are, in fact, the leaves of the evergreen. The reason the evergreen’s leaves, or “needles”, are so different from broad-leafed plants is because wide leaves cannot tolerate cold temperatures. Evergreens’ needles allow the tree to continue intaking sunlight and nutrients during the colder seasons observed in many world climates. The needles and leaves on the evergreen are fascinating for another reason, too. Evergreens have distinct pH preferences in the soil. Unlike deciduous trees, evergreen trees can tolerate high levels of acidity and low levels of nitrogen. This carbon-nitrogen ratio encourages the growth of evergreens. What is particularly neat is that the evergreen needle and leaf litter maintains this higher ratio. Once evergreens have begun to propagate in a particular region, they will also begin to drop leaves that will make the soil increasingly preferable for evergreens. In this way, evergreen trees slowly push out deciduous trees, which are less able to withstand the higher acidity. Over time, evergreens will begin to overtake the region, providing shelter for smaller evergreens. So maybe you are not looking to plant an entire grove of evergreen trees. That is okay! There are lots of evergreens available for landscape use around the yard and home. From privacy trees to ornamentals, accent trees to shades providers, evergreens can satisfy a variety of functions. Part of choosing the right evergreen is looking for those species that grow best in your specific climate, or USDA Hardiness Zone. You also want to look for a tree that meets your maintenance requirements. Finally, you will want to select an evergreen that matches the need for which you are buying it; beauty, privacy, shade – make sure the species you choose fits your personality and desire. Below are a few evergreen species with a short description that includes information on growing zones, maintenance requirements, and common uses. We could never list all evergreen species here, so be sure to visit The Tree Center to investigate others if the right fit is not listed below. 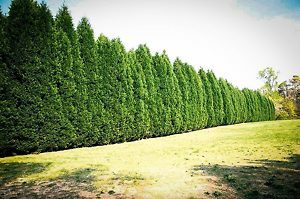 The Thuja Green Giant is an enormously popular privacy tree used throughout many regions in the United States. 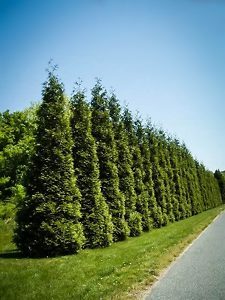 When grown in rows, the Thuja Green Giant creates a uniform and pleasing screen that blocks out unwanted sights and noises. These drought tolerant and disease resistant evergreens are tough – prune once a year to improve growth and appearance. The Leyland Cypress is the most popular privacy tree in the United States. 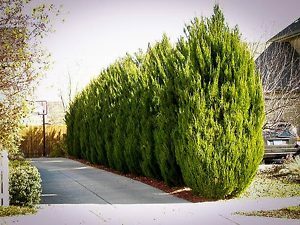 Covering a wide range of growing zones, the Leyland Cypress is a somewhat rounded evergreen hedge with soft, feathery leaves or “needles”. These fast-growing trees require only a once-a-year pruning to keep them in the best shape, though even that can be neglected. Uniform, symmetrical trees will still greet you along the driveway or along the backyard property line. The distinct smell of Eucalyptus will greet you each morning as you pass by the fast growing Eucalyptus tree, which usually reaches about 40 feet in height. 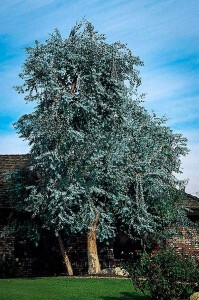 Providing cooling shade from the hot summer sun, this small medium-sized accent tree can be placed in a central location of the front yard or placed among a smaller garden as an ornamental tree. This drought-resistant tree is also exceptionally fast-growing, gaining as much as 6 feet a year. 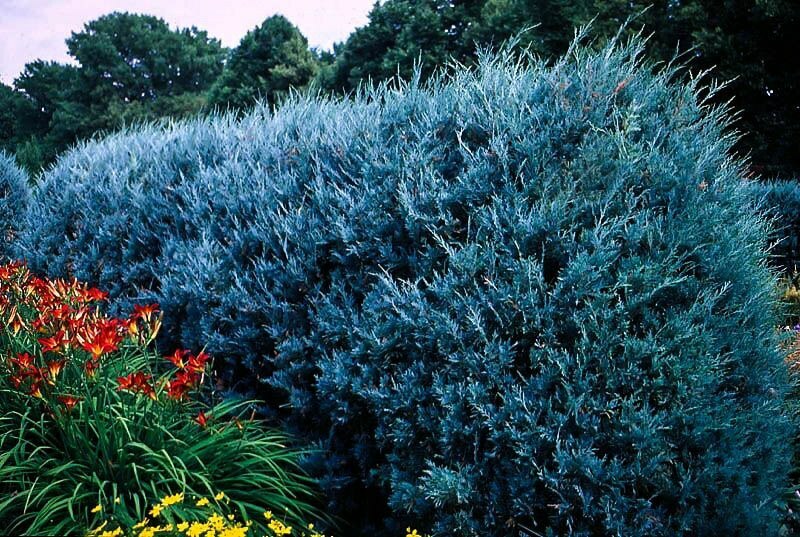 The Sky Pencil Holly is a rare upward-growing evergreen that requires minimal maintenance. Many gardeners choose to plant this intriguing plant in a garden location where it is the focal point or accenting a more showy plant. The Sky Pencil Holly’s unique branching makes it an attractive plant. In addition to this, this Holly does well when planted in rows, making it the perfect, unique privacy tree. The Spartan Juniper is a fast-growing evergreen capable of reaching between 15 and 20 feet tall. 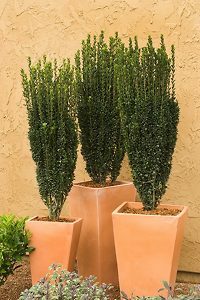 This evergreen displays a columnar shape, making it a beautiful ornamental tree when placed in central locations. Some gardeners also choose to use the tree to accent larger specimens or colorful garden beds. The Spartan Juniper is also drought-resistant, cold-hardy, heat-tolerant, and salt-hardy – nothing gets in its way! Besides you, of course. Some moderate pruning will be needed to maintain shape and size.